I asked for it now is time to point my rigs to the Super Multipool! Pool dev is currently working in background. There will be an update soon. Having problems on the multipool cant get any accepts ? anybody having the same issue? In which algo do you have this problem? 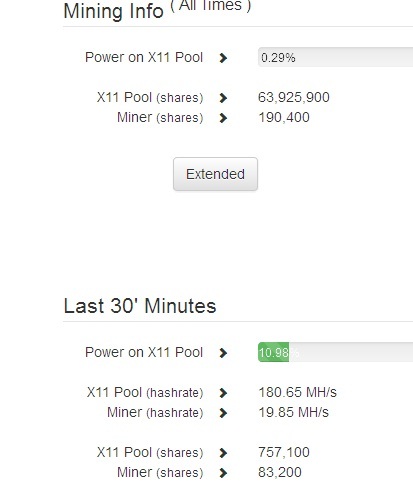 Otherwise stats here http://supermultipool.com/miners and it looks like working fine to me. First payment with SUPER may be done in the following hours and you will see in explanation or detail area the pool address SuperMultipool.com. Sorry bout that is with X11 no am getting some accepts but just a few like 3-5 i've tried with all the servers but nothing if i do mine to other pools i get 100% accepts.? Paste your command you tried to connect pool here. And which miner software you used? Give us some details. I wanna miner, but I don't have a pc for that. Can I mine it in my windows? Using VM? Or rent a rig? If rent, where? I understand something about exchanges, but mine I'm really noob. No, your need a Grafikcard/Rig or ASICs. Rig rent can be an option but I do not know if it is profitable. What is your stat address on supermultipool.com / ?? I'm in contact with the pool dev. He'll help you.